It is fully automatic control by screen touch panel, and can upgrade to include mirror or embossing surface cooling roller, turn bar, recycling system, cooling system, primer coater, surface treatment device…etc. Application can be woven sack, cement bag, onion bag, paper cup / milk box, non-woven fabric..etc. The extruder is specially designed for good melting and stable extrusion. It is available to add masterbatch or other functional additivities. The working width of T-die can adjustment during machine production. Film edge are stable flow rate and can control thickness. This device offers stable winding tension, the finished winded roll could be loaded on floor for a long time, and keeping round winding shape without deformation. Also the roll can be changed without stopping the machine. Clean and pre-treatment surface of material to increase the adhesion force on the surface of material before lamination. Tubular woven fabric through turn bar only by one T-Die to do both sides lamination at the same time. This machine can rewind large roll to become small roll. 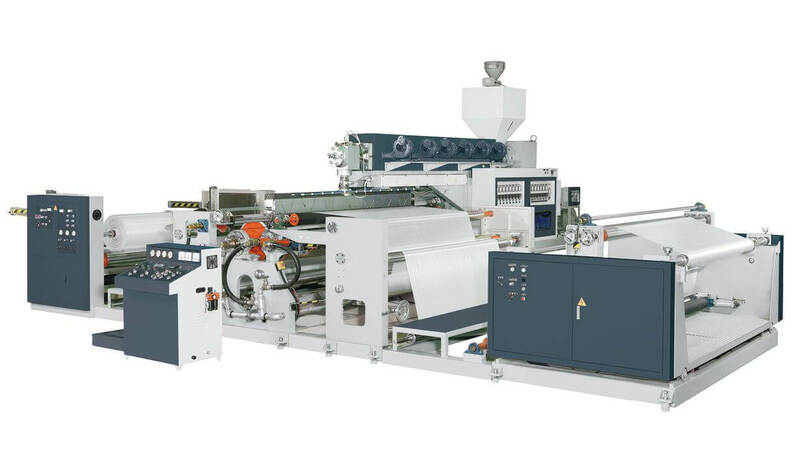 The special design for BOPP film or Aluminum foil for sandwich lamination process. The round knife will follow the sensor to track the laminated edge and trim it. WORKING MATERIAL PAPER, WOVEN FABRIC, NON- WOVEN FABRIC (SPUNBOND), BOPP FILM, ALUMINUM FOIL, ONION BAGS.